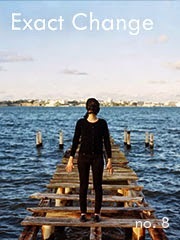 The current issue of the e-zine Exact Change (No. 8) features my illustrated article 'A Primer of Post­-Electronic Music and the Alchemical Subharmonic Lottery'. 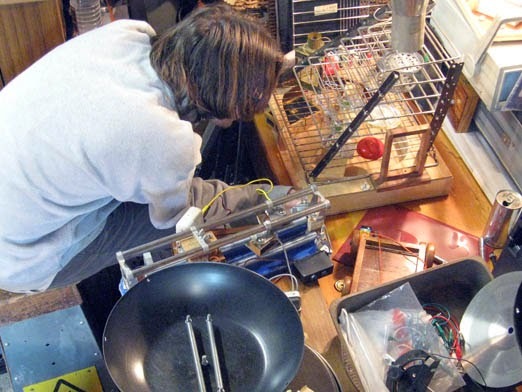 This gives an outline of what I'm inclined to call 'acoustic circuit-bending' - a technique revolving around electromagnetic feedback fields and the acoustic coupling of found materials - a form of 'post-electronic' soundmaking. The concept of 'post-electronic music' was first elucidated in my rambling, incoherent 2005 book Dropping Out where attention was drawn to the benefits of electrically sustained vibrations in mechanically drawing out combinations of subharmonics in acoustic apparatuses. This inversely mirrors somewhat the emphasis on harmonics in traditional electronic tone building. The practice was tied to dumpster-diving, where unpremeditated object combinations can be observed. I originally wanted to recreate the complex sounds sometimes heard when travelling on decrepit old trains - and this precipitated a peculiar habit of resonating every ferric object I could find. To my present shame, Dropping Out incriminated me for multiple indiscretions. The foremost was my description of attempts to resonate rows of lampposts. The concept had such genuine sonic promise, and it was not my intention to deliberately antagonise. The acoustic potential of lampposts can be beheld by using a soft-headed mallet to strike the tubular neck, and immediately placing one's ear to the lamppost. Because the tops of lampposts are usually open (to prevent build-up of humidity / moisture? ), bits of leafy grit and muck accumulate inside the tube, and the striking of the mallet shakes down all this grit in a harmonic metallic cascade. Many different partials and upper modes of vibration momentarily manifest themselves in this luscious sound. Extensive trials also reveal that although lampposts - clustered in a particular street - are standardised in their construction, every lamppost has slightly differently pitched resonant frequencies. Any low fundamental tones - typically associated with pronged structures - are absent in lampposts. They are heavily damped to prevent this. One may imagine, in some parallel universe where lampposts are undamped, on a blustery day they may gently hum in the wind: aeolian lampposts. I dreamt that powerful electromagnets in cradles could be clamped to the necks, and rows of lampposts could all resonate in a chorus... 'Bowing' lampposts with giant Ebows. But, because of this damping, electromagnetic resonation is impractical, and only the higher frequencies are accessible, therefore a piezo-electric system was devised. The project, however, was scuppered in a 'disgraceful' attempt to have each lamppost self-powered by step-down transformers drawing off their own mains supply. 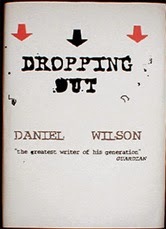 This is described in embarrassing language in Dropping Out (a juvenile production - and I'm relieved to say that copies are not generally available at the time of writing this). Subsequent to this, some experiments were made with bits of lamppost and other street furniture. 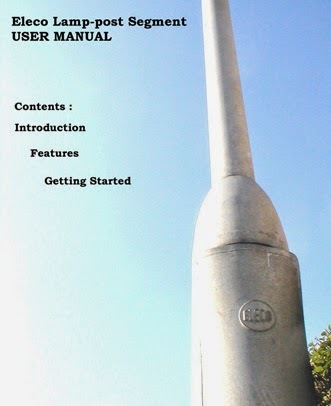 Cover to a manual relating to a slice of errant lamp-post resold as an experimental instrument (circa 2003). A similar effect to the imagined streets of resonating lampposts can be realised by resonating railings. Like a grille, each rung has an ever-so-slightly different resonant frequency (a typical railing has a very low fundamental tone of around 30-50Hz). Cardboard, plastic or wooden boxes can be wedged into the resonated railings to act as sounding bodies to diffuse the sound or introduce buzzing subharmonics. When multiple railing rungs are resonated, an internally conflicted drone is produced that is both lively and trance-inducing when concentrated upon. I was embroiled in an interesting altercation last year during a busk in Cambridge with my electromagnetic apparatuses. I had procured some coinage on previous occasions through busking on my resonated wok toneshapers powered by car batteries. 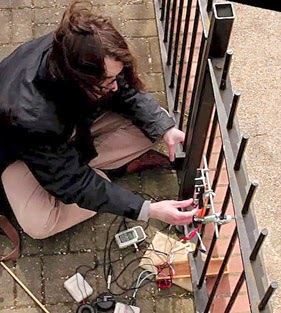 On this occasion, I was busking with my baking tray resonator (which drones and alters its harmonic/subharmonic content according to the arrangement of coins inside the tray - £17.24 was obtained on this particular day) alongside resonated railings that I had engrafted my gubbins onto. Two Police Community Support Officers accosted me. I had assumed they would take umbrage at my electromagnetic 'EBowing' of street furniture, but this was not the issue. Apparently, doing toneshaping drones is a form of begging(!). A handwritten sign encouraged passersby to throw coins or paper notes into the EM resonated baking tray to alter the tone of the drone. I argued that it was plainly *busking* which is perfectly legal - hence the acoustic element. But they disagreed - it was begging because there was no "music". We then argued very publicly about what constitutes music, touching upon every argumental cliché that has ever been farted out in amateur music-theory debates since the 1900s, but the argument took a surreal turn, because the PCSOs then accused me of committing a public order offence by simply protesting my case to them! The argument itself became an offence! I couldn't argue with that, although it was they who initiated the argument. Read all about acoustic circuit bending and the use of electromagnetic coils to resonate objects in Exact Change #8. In fact, 'reading' is a bit old hat now. Being an ultra-modern e-zine, you can also look, listen and watch! Great minds must suffer torment.